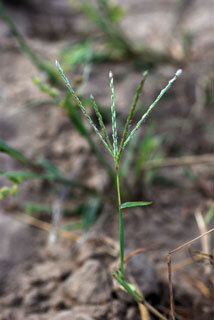 Cynodon dactylon (L. ) Pers. Culms: Erect or ascending, decumbent below, wiry, usually hollow, glabrous. Blades: Flat or folded or margins loosely in-rolled, .4 to 6 inches long, 1/25 to 1/6 inch wide, rigid, spreading, often conspicuously 2-ranked; upper surface rough; lower surface glabrous; usually hairy near ligule; tip tapering to point. Sheaths: Crowded at base of culm and along stolons, open, mostly glabrous, long-hairy near ligule. Ligules: Membranous, short, fringed; long hairs on either side. Inflorescences: Whorl of 3-7 spikes arising from common point, each .8 to 3.2 inches long, slender, finger-like, purplish. Spikelets: Numerous, flattened, sessile, over-lapping in 2 rows on 1 side of slender rachis, 1-flowered, 1/12 inch long; glumes narrow, lanceolate, 1/25 to 1/10 inch long, 1-nerved, tapering to sharp points, awnless; first glume shorter than second; lemmas boat-shaped, 1/12 to 1/10 inch long, firm, flattened; tip pointed; awnless, lemma keel minutely pubescent to long soft-hairy. Habitat: Open disturbed areas, pastures, fields, lawns, roadsides. Reproduction: Rhizomes, stolons, and seeds. Toxicity: Toxic in rare instances. Know to cause cyanogensis. Symptoms are abrupt onset, weakness, apprehension, labored breathing, and seizures. Also know to rarely cause photosensitization. The cause is unknown, but tends to occur in winter and early spring. There is abrupt onset, reddened skin, blistering, and scratching. Low occurrence in North America. Forage Value: An important pasture grass in the southeast of the United States. It is highly palatable to cattle and provides some forage value for deer. Ducks and geese eat the seeds. Uses: Bermuda grass is often planted in lawns and golf courses and is sometime used for erosion control. Comments: Bermuda grass is a variable species that forms low-growing mats. It is drought tolerant. Bermuda grass is known to cause allergy symptoms.